Match the costume to the character -- make the character's clothing, armor, pets, weapons and hairstyle match his/her attitude! 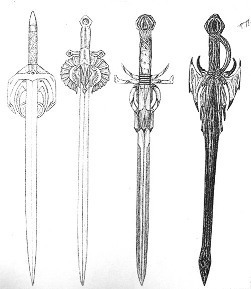 Can you picture the type of character who would use the swords on the right, just from looking at them? The first sword is light-colored, straight and simple. This sword is probably for a 'Good' character, like a knight. The second sword is more exotic, it looks more complicated and has a flying creature for a hilt. It could be a magical sword. The character who wields it could be a mysterious women, like a sorceress. If the sword isn't magical, maybe a ninja-like character or a nomad would use it. The third sword is spiky and slightly scary! It is definitely a magic sword, and might be evil. A cloaked magic-user or evil knight could use this sword. The fourth sword is EVIL! It is dark-colored, has an eye in the pommel, and spiky bat wings for a hilt. The sword almost looks like a dragon. It looks alive. A powerful evil character would use this sword, and probably ride a dragon or bat-winged horse as well. Try it! Try drawing a sword or other weapon to match your character!